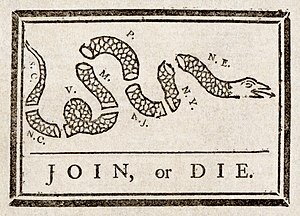 Time for a segment of “A moment in obscure history.” This time, we’re looking at the constitutional dispute that resulted in the American Revolution. Suddenly, propelled by Glenn Beck, books like The 5000 Year Leap , a right-wing conservative’s guide to the making of the federal constitution, “leaped” to the Amazon best seller list (it’s now listed at 2,615 overall and the top 100 under “Politics”). While it provides only a simple, somewhat white-washed, and superficial vision of the US Constitution, no amount of increased attention in our federal constitution is too little. Neither the revival, however, nor questioning the constitutionality of the federal laws, is unique in history. In fact, it was a dispute over the constitutionality of a central government’s actions that lead to another major event in our country’s history: the American Revolution. Whether the king-in-Parliament, the ultimate source of statute law in Great Britain, could legislate for British colonies overseas was the ostensible question in dispute, but many other related and even deeper legal issues involving the nature of the constitution of the empire and the location of sovereignty within the empire emerged from and were thoroughly canvassed during the debate. It was only after the conflicting opinions of metropolitan Britain and that of the colonists failed to be reconciled that open warfare broke out in 1775, and it was why the decision to broach the topic of and ultimately pursue independence from Great Britain was so cautiously and tentatively pursued. The colonists considered themselves British subjects, citizens, not vassals and secession was not a choice they relished. As free-born Britons, the colonists assumed, they could not be subjected to any but what Bland referred to as “a constitutional Subordination” to the parent state. The nature of this “constitutional Subordination” was such that the colonists readily accepted the authority of Parliament in certain areas, but balked at the idea of taxation, seeing it as beyond Parliament’s authority. “Indeed, considerable evidence suggests that the colonists’ strong initial impulse was to exclude Parliament from all jurisdiction over the domestic affairs of the colonies.” (p.79) Like our modern idea of the federal government, the states concern themselves with their domestic activities while the federal government’s most basic responsibility is national security. Interestingly, from a historical perspective, we start to see the first signs of federalism in the disputes between the colonies and the home country. Sound familiar? If you hear the foreshadowing of the federalism that would be later inscribed into the US Constitution, there’s a reason. It was rooted in the relationship between Great Britain and its far-flung colonies. If, during the last couple years, you’ve found yourself at all more interested in the federal constitution and the limitations it places on the federal government, I urge you to look at the role constitutions, and constitutional disputes, played in leading to our own American constitution. It’s a great read, if a bit scholarly, and evidence that whether a law is constitutional is not a new question, but actually may be at the very root of the American experiment and its origins in the American revolution. The American revolution was not, nor is it today, an obscure moment in history, but rooted in obscure legal disputes between the colonies and mother country, long predating the Stamp Acts and the Boston Massacre. 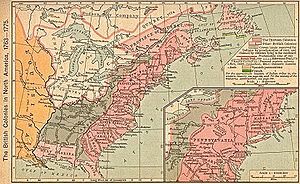 It began as a constitutional dispute between the central government in London and the British colonies in America. Understanding why the colonist went to war, how they got there, and the legal battles that preceded the battlefields can be useful in understanding why the Founders drafted what they did–into the Declaration of Independence and into the federal constitution–and what those words mean to us now, even in the midst of our own constitutional disputes. 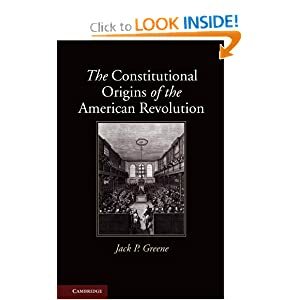 Pick up The Constitutional Origins of the American Revolution by Jack P. Greene from Cambridge University Press, 2011. This entry was posted in Constitutional Law, History and People and tagged 1600s, 1700s, 5000 Year Leap, American Exceptionalism, American Revolution, British Empire, constitution, Constitutional Law, History, Jack P. Greene, Thirteen Colonies, United States, United States Constitution. Bookmark the permalink. This is a great assessment of Greene’s excellent work. But I have to disagree with one conclusion. The constitutional disputes at issue were not then, are not now, and never have been “obscure.” The issue of whether the “King-in-Parliament” (viz., Parliament at Westminster, sans American representation) held legislative authority over the coloines touched issues of representative government, legislative legitimacy, separation of powers, and individual liberty. The major stressor to this century long constitutional dispute regarded whether the Glorious Revolution settlement affected the colonies’ traditional right of self-governance (note, not self-determination). The doctrine that emerged following the Glorious Revolution was parliamentary sovereignty, meaning, all state power redounded to the Parliament (directly the House of Commons). This had an internal logic as the Commons was truly the only representative body within England at the time, and the reign of the Stuarts could fairly be said to be against majority will. The problem with parliamentary sovereignty as it developed, however, was its federal implications. The colonies had no rights of representation, and the very same whig political philosophy which justified the Glorious Revolution denied the right of Parliament to govern unrepresented subjects. For the English whigs, they were stunned that the colonists questioned parliamentary supremacy as it was a genuine revolution in favor of individual liberty (representative governments obviously protect most individuals better than unaccountable kings). Further, they wondered how the actual laws passed by parliament could be seen as threatening to liberty. In fairness, Americans were far less taxed, regulated, and touched than the English themselves. It all seemed quite puzzling. The American whigs, however, saw any exercise of power to be tyranny unless specifically consented to. This is not a shocking proposition now, but that shows how fundamental the dispute was. For the English, the idea of parliamentary supremacy made sense due to its internal representative logic. The Americans, however, recognized very quickly the problems associated with unaccountable legislatures (the intractable “tyranny of the majority problem”). I think Greene’s best insight (one shared by John Phillip Reid, Bernard Bailyn, and Gordon Wood), is that the American Revolution was a constitutional crisis. The larger lesson is that genuine constitutional crises do not resolve themselves through normal mechanisms. All of this says to me, that constitutionalizing politics is a very dangerous game.